We take great pains to make sure our patterns are correct but sometimes things slip by. When mistakes are identified we will post them here. We also include the correction in any future pattern sold until reprinting solves the problem. We apologize for any inconvenience. The first printing the Fabric Requirements missed 1- 3” x 22” greenish gray for leaves. The fabric was/is included in the kit. In the cutting directions add Cut 1- 4" square of Gold fabric. Omit the 1- 4" square in the Assorted Greens. Pattern calls for 2 yards Muslin but should read 4 1/2 yards. The first few complete "Shop Sets" shipped without the total fabric requirements. Please call us and we will send that to you. In the Set Up Instructions the cutting directions read cut 8- 3" x 13" sashing from black. This should read cut 17- 3" x 13" sashing. In the cutting requirements we missed the 2" Square Purple for a leaf. The wool was included in our kits. Cutting directions call for 1- 1" strip WOF of black and 1- 1" strip WOF orange. Both should read 2- 1" strips WOF. Directions have you sew one orange strip to black. You'll need to make two strip sets to get the 36 orange and black pieces. Cutting directions call for 2- 23/4 x 91/4" of black, this should read 2- 23/4 x 91/2". These are the top and bottom borders used in the quilt lay out. When making the churn dashes, I used 1" finished Thangles, making them 1 1/2" unfinished. The pattern called for the wrong size (1.5" finished). In a few of the early patterns the Wool requirements called for 2" x 21/2" green. We added the star which makes the green wool requirement 4" x 21/2" green. The kits had the proper sized fabric included. Pattern calls for fat 16th of Red for star points. This should be 1/6th yard of red for star points. In first printing there was mistake in fabric requirements. Add 1" square orange for nose and 21/2" square brown for arms. Disregard 21/2" square gold for windows. Pattern states; Sew on the left and right pink 1/2" x 17 1/2" borders. It should read 3 1/2" x 17 1/2" borders. The applique pattern (letters) are not reversed. 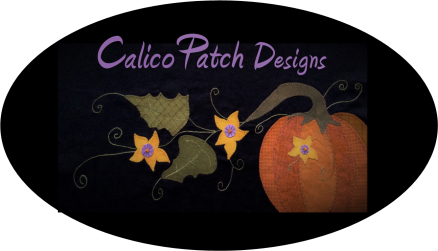 Reverse the pattern when drawing on the fusible. Block 4- Pumpkin Stitching Section. Fabric Requirements call for 1- 3" strip of green and black, change to 1-1/6th yard of green and black. Block 5- Basket Section. Fabric Requirements call for 1- Fat 8th of cream, change to 1-1/4 yard of cream. The cutting directions need to add: Cut 6- 21/2" squares for each of the colors Green, Red, Yellow, and Purple. The fabric for these was included in the kits. The Maple leaf and log cabin blocks should measure 6" unfinished. The pattern called for 6 1/2" unfinished. Our kits had the proper amount of fabric included. Do not cut on the diagonal, Keep 33/8" square. Block 4- Memory, step 2 the fabric pieces F and G are reversed. Sew F to B and G to D as shown in the diagrams. state 8" but should be 9" square. Fabric Requirements: 1/8th Yard Blue Flannel is changed to 1/4 Yard. Cutting Requirements: Under Blue Flannel- Cut 2- 31/4 x WOF (pattern say cut 1), Subcut onto 20- 31/4" squares (pattern says 10). Under Pieced Border use these 20- 31/4" blue squares (pattern says 31/2").